Sons & Daughters LISTENING PARTY! CLICK ON THE ALBUM COVER RIGHT NOW TO REGISTER! Playing songs off the new record “Sons & Daughters,” Rachel will also be sharing stories about her life, the making of the album, her family etc. She will also be playing some songs live with stories on video. The night of course would not be complete without coffee, drinks, finger food, gifts, give aways, and more. THE PURPOSE FOR THE LISTENING PARTY IS TO GIVE YOU THE FAN, THE FIRST SHOT AT HEARING THE NEW ALBUM FIRST! THE COST FOR ATTENDANCE IS $10. By attending you will receive a voucher to receive one of the first copies of the new album* FREE! Space is limited to the first 100 Fans, so register NOW BY CLICKING ON THE ALBUM COVER! 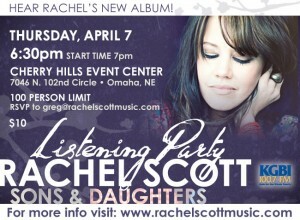 THESE ARE PRE-ORDERS FOR THE CD RACHEL SCOTT “SONS & DAUGHTERS.” THE PHYSICAL ALBUM WILL NOT BE AVAILABLE ON APRIL 7TH. IT WILL BE AVAILABLE IN MAY AT THE CD RELEASE. TENATIVE DATE FOR CD RELEASE IN OMAHA – MAY 12TH. TENATIVE DATE FOR CD RELEASE IN COLUMBUS, NE – MAY 13TH. Dates for CD releases, will finalize by March 31st, so check back then. I’ve been trying to register for the Listening Party for at least the last 1/2 hour to hour to no avail. I’ve tried everything I can think of can you please help me? It says there are only 66 people registered so far.